Bake your ham in 7UP to take advantage of the sweet and acidic properties of the soda. 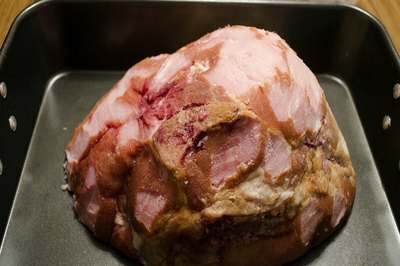 Use 7UP as a meat tenderizer for your ham; the liquid will keep your ham from drying out in the oven. Combine the dry rub ingredients with the soda to create a sweet and tangy glaze on the ham. 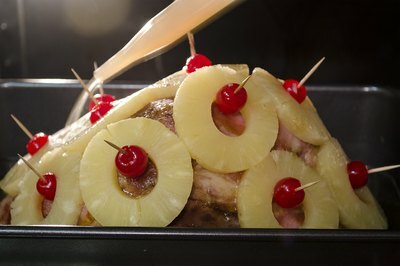 Serve a 7UP baked ham at your next Easter dinner or holiday get-together for a treat that will please a crowd. Preheat the oven to 250 degrees Fahrenheit. Cut the outer layer of skin -- the rind -- off the ham. Rinse the ham with hot water. Cut the outside of the ham in a 1/2-inch-deep checkered pattern. Place the ham, fat-side up, in a roasting pan. Add 1 cup of dark brown sugar that is firmly packed with 1 tsp. of dry mustard in a small bowl. Stir well. Rub the dry mixture over the outside of the ham, pressing the mixture into the crevices of the ham. Insert the end of a toothpick into 12 maraschino cherries. 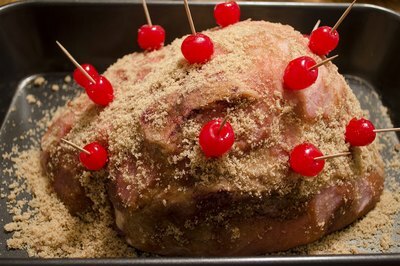 Press the other end of the toothpick into the ham, so the cherries are touching the surface of the ham. Space the cherries evenly across the ham. 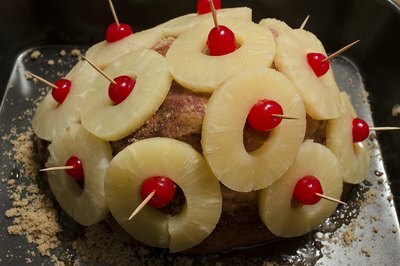 Hang a pineapple slice ring over each cherry, so the pineapple lies against the ham. Pour one 12-oz. can of 7UP over the ham, slowly so the dry ingredients are not washed off the surface. Place the ham in the preheated oven. 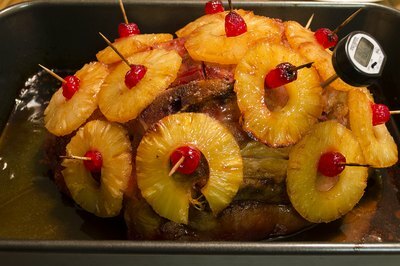 Baste the ham in 15-minute increments using the juices from the pan. Bake for two to four hours or until the internal temperature reaches 140 degrees Fahrenheit. Allow the ham to rest for 20 minutes before carving. 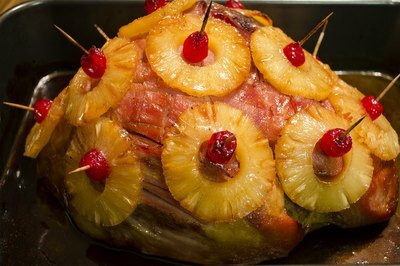 If you are baking a half or quarter ham, wrap the outside of the ham after you cover it with spices and fruit with foil. Do not serve a ham that has not reached the internal temperature of 140 degrees Fahrenheit.